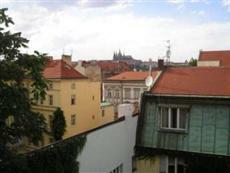 The Apartments Bartolomej is perfectly located for both business and leisure guests to Prague. The Apartments Bartolomej boasts a convenient location with modern amenities in every guestroom and superb service. Each guestroom is fully equipped with non smoking rooms, television, bathtub, shower, kitchenette, balcony/terrace. Guests staying at this Prague accommodation can enjoy a wide range of hotel facilities such as elevator, bar/pub, tours, babysitting, pets allowed. With elegant facilities and hospitality, guests at this hotel will surely have an impressive stay. To reserve a room at the Apartments Bartolomej, simply select your dates of stay and fill in our secure online booking form.